Have you taken your Vitameatavegamin today? A double-walled ceramic mug, it's the I Love Lucy Vitameatavegamin Travel Mug with Handle. This mug holds up to 14 ounces of liquid. The I Love Lucy Vitameatavegamin Travel Mug with Handle fits in most vehicle cup holders and is both microwave and dishwasher safe. 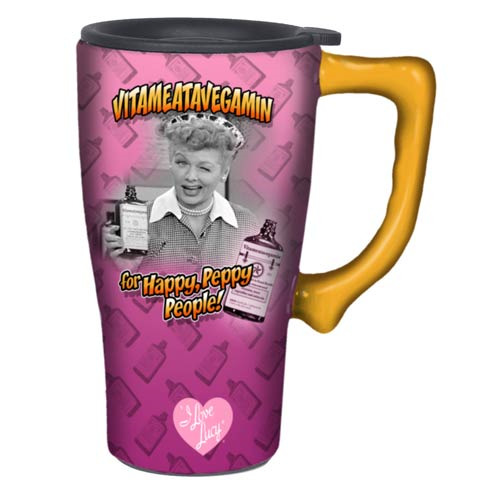 Based on one of the most popular I Love Lucy episodes ever, the mug features Lucy in an image right out of the show, plus the words "Vitameatavegamin… for Happy, Peppy People!" Measures 6 1/2-inches tall.